Guide4WDW.com: Planet Hollywood Observatory at Disney Springs - Late Night Dessert Is The Way to Go! 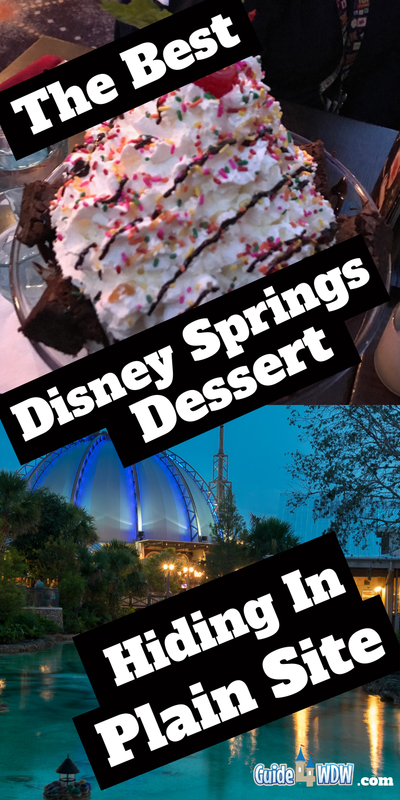 Planet Hollywood Observatory at Disney Springs - Late Night Dessert Is The Way to Go! 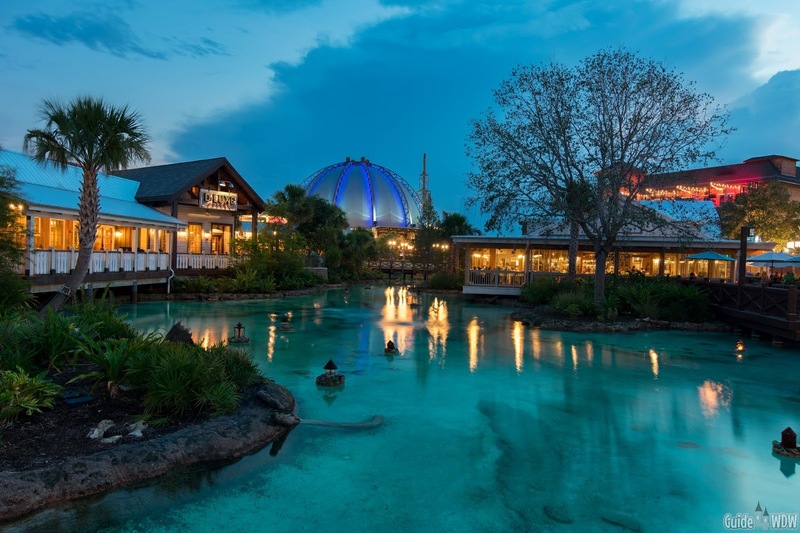 Disney Springs has changed drastically over the last several years. The once adult centric Downtown Disney has changed in ways that even the most avid Disney fans never could have imagined. If that change is good or bad is entirely up to personal interpretation. I personally love the changes for so many different reasons. Of course it does have it's downsides and in my option they missed an opportunity to unveil a whole series of Disney specific retail locations or one off boutique style locations in favor of more mainstream luxury retailers. However, and at the same time, the decisions made helped develop an atmosphere that so many different audiences can enjoy and appreciate no matter what your age or particular stage in life may be. There really is something for everyone. Today's article is perhaps the perfect example of all of this thrown into one particular dining location. Years ago, Planet Hollywood was far from the ideal place to eat at Downtown Disney. It was a hangout spot hinging on brand awareness and a prominent building that everyone wanted to see inside. Of course, that was never their marketing scheme but at the same time that's essentially what the location became. It was a place to hold large crowds if the need presented itself and a pop culture reference in the heart of Walt Disney World. Today, that experience has been turned upside down in many ways and tends to embrace a different experience and different set of goals than it once did. After a recent visit to Planet Hollywood, after putting it off for years on end in favor of other new dining locations without a "history," we caved and gave Planet Hollywood Observatory another shot. It is certainly worth mentioning that this is not the same restaurant it once was and, to be quite honest, it appears as if the only thing that hasn't changed is the dome shaped structure itself (which is a good thing). The cast is excellent, the decor is far more modern and upscale than it once was, and now it looks like a fun and inviting dining location rather than a tourist trap. All of this is fine and good, but I know the real question you're likely asking at this point, "How's the food?" If I'm being completely honest, I had one desire to go back to Planet Hollywood and it was to try the borderline ludicrous desserts on the menu. 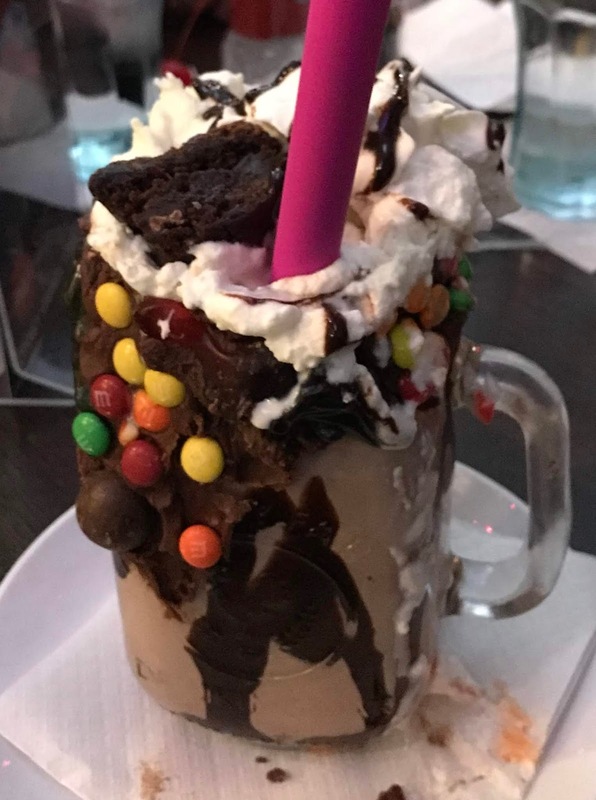 The towering Super Nova shakes are piled high with candies and various toppings accompanying select flavors, and they truly are an impressive sight to say the least. Another show stopping option is the Brownie Sundae Martini. Truthfully, the sundae alone is the reason I'm writing this article! 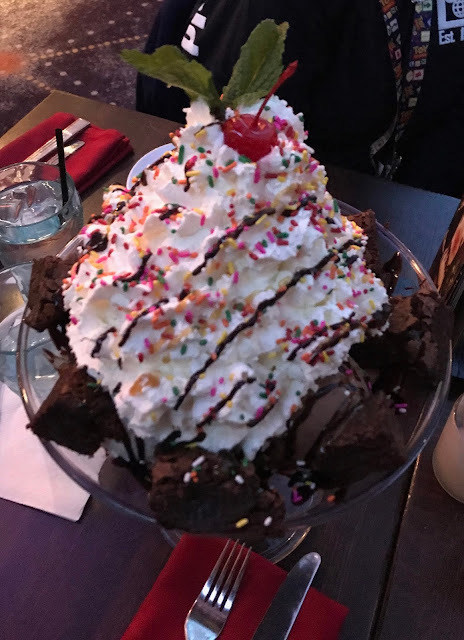 I'm sure the other dessert items (including a Banana Pudding Star Jar, a Brownie Cheesecake Star Jar, a Key lime Pie Star Jar, Sticky Toffee Pudding, and a few others) are incredible as well, but the Brownie Sundae stole the show and gathered a crowd when it arrived at our table. I know that sounds like an over reaction, but we literally had the table next to us ask if they could take a picture of it. It's that absurd... in all the right ways. Just to put the description on paper it includes twelve brownie chunks, 6 scoops of vanilla and chocolate ice cream, caramel and chocolate sauce, and what looks like an entire bottle of whipped cream. I'm not sure if it would beat the Kitchen Sink dessert over at the Beach Club in size but I have to say this thing is quite the presentation when it's brought to the table. In our case, we only went to Planet Hollywood Observatory for dessert, and ate our actual meal a little earlier in the day. However, this dessert easily fed four us and we still couldn't manage to finish the concoction. Our server even mentioned that the only group she had seen completely finish it was a sports team that all shared the colossal dessert. To accompany the Brownie Sundae, we felt obligated to try at least one of the Supernova shakes (you know... for research purposes of course) and I have to say it was one of the best milkshakes I've personally tried. It was incredibly rich and while obviously your milkshake preferences and mine may vary, it is quite an impressive dessert on its own. Long story made short, the desserts alone are worth the visit. If you are concerned about your budget, this may not be your best option. The massive Brownie Sundae is $19.99. It is the most expensive dessert on the menu but the majority of desserts range from $9 to $14. At first, that does sound quite pricey and the overall menu is quite expensive as well, but the portion sizes are unbelievably large. Everything we tried or saw being served around us could have easily been split among multiple guests which would theoretically shrink the cost of the meal. The atmosphere is one of those things you're either going to love it or hate it. It's an upbeat, loud, and quite exciting environment for lack of a better word. The music is piped in, a sing along isn't out of the ordinary, and the DJ on stage this particular night even pulled out all the stops and wore a construction hat to mimic the Village People as the entire dining area sang YMCA. It's not a place you go for a quiet get away style meal but it's not in any way designed to be. Additionally, while it is kid friendly, it is worth noting that pop culture references and music are unmistakably present and I do know some parents may or may not agree with every music video that is being shown on the massive screen encompassing the majority of the dining area. In my opinion, it's just a fun environment. Of course, I am 22 years old so that is something that you should and likely will take into consideration. In the end, we had a blast and while Caitlin and I were joined by our parents, they did enjoy the experience for the most part as well. Again, it's going to be one of those love it our hate environments. Considering all of this, if you want an over the top experience to accompany your Disney Vacation or trip to Central Florida in general, I do highly recommend Planet Hollywood Observatory. In my opinion, the ideal plan here is to snag a later nighttime reservation (ours was at 9:45pm), order some desserts, and then return another day for the full dining experience. It not only gives you the opportunity to try the dessert on its own but also allows you to get a feel for the atmosphere before committing to a full meal if you're at all concerned about that aspect of the experience. As always, in the nature of full disclosure, we were not paid to write this review and paid for everything we ordered out of pocket. In all honesty I didn't expect this to be a positive review but I must say it was well worth the money and time spent.